We drove north out of Pullman heading for Spokane around 5 p.m. and the drive was nothing short of magical in terms of weather and the play of light over the golden fields of the Palouse. I hadn’t made the trip from Pullman to Spokane in about four decades, so didn’t really remember much about it. That just made it all the more fun and practically a new experience, with endless miles of that open, rolling, hilly countryside spooling off into the distance, and most of the time not a tree in sight. As a place to live, I wouldn’t rate it very high – I like trees. A lot. But for a one-off drive through some very different terrain, it makes for quite a spectacle. You almost start to get a little of that Twilight Zone feeling, that you’re going to keep coming around the same bend in the road and seeing the same ribbon of empty highway and yellow stubbled wheat fields stretching out beyond it for the rest of your life, while waiting for that eerie theme music to start twanging in your ear and Rod Serling to appear in the back seat, smoking his cigarette and smirking at you. Luckily, this didn’t happen and eventually the Palouse country did relinquish it’s hold on us, albeit reluctantly. More and more trees began to sprout from the hillsides while the wheat fields slowly vanished. Civilization returned in the form of small towns and billboards, and before long we hit the outskirts of Spokane. 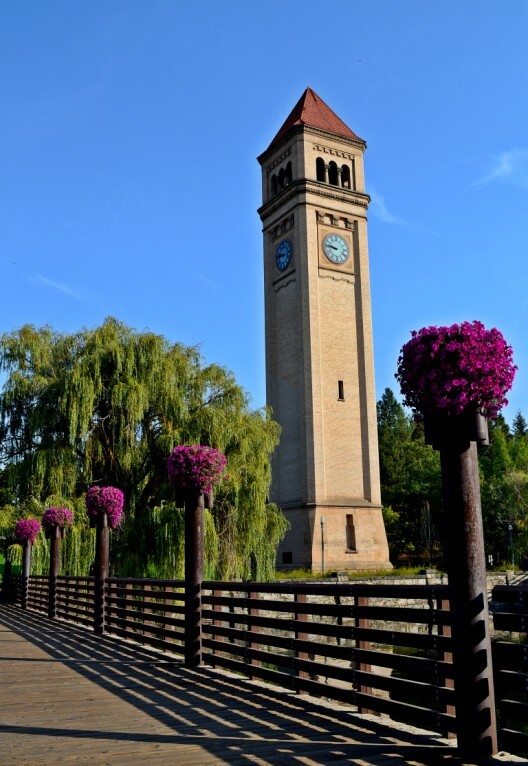 Spokane is a city of just over 200,000 population and, believe it or not, the largest city between Seattle and Minneapolis. That statistic tells you how little there is in terms of metropolitan areas in the northern mountain and plains corridor of the country. If you’ve ever made the drive from Seattle heading east on I-94, you’ll understand. Notable Spokane natives include old-time crooner Bing Crosby, NBA Hall-of-Famer John Stockton, Chicago Cubs Hall-of-Famer Ryne Sandberg, and Hollywood actors Darren McGavin and Craig T. Nelson. 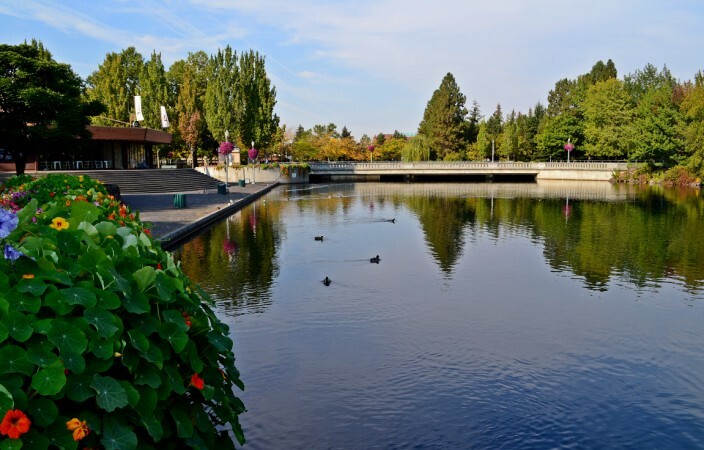 A must-see if you’re in Spokane is the 100 acre downtown Riverfront Park area, created on the site of the Expo 74 World’s Fair grounds. 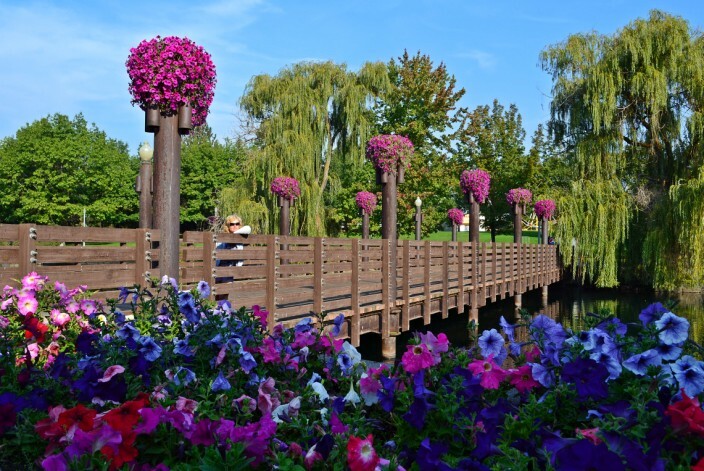 Walking paths and lots of trees and flowers line both banks of the Spokane River. 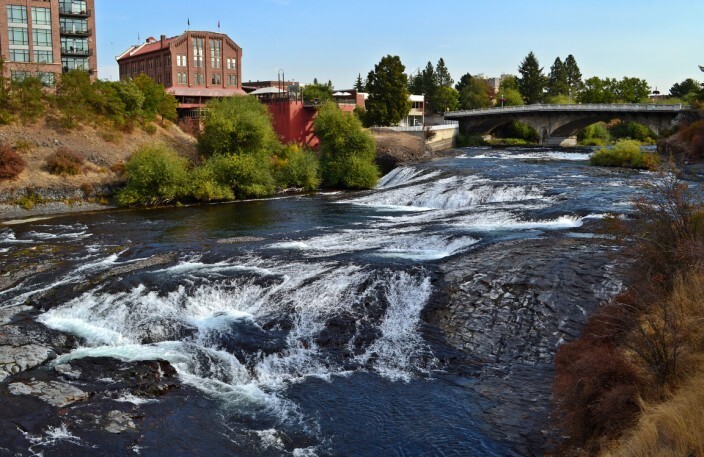 At the western end of the park the river diverges around Canada Island and takes a tumble through scenic Spokane Falls. This is the real heart of the city and where it all began as a trading post back in the early 1800’s, although the city wasn’t officially incorporated until 1881. 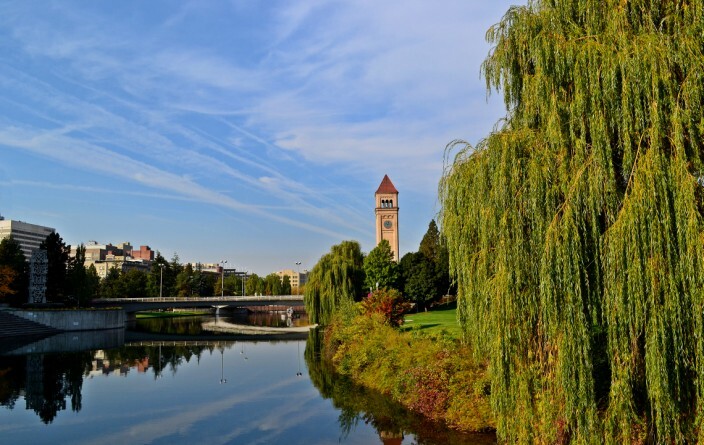 Besides being the second largest city in the state, Spokane serves as the unofficial capital of the Inland Northwest region (sometimes called the Inland Empire) consisting of Eastern Washington, Northern Idaho, Northwestern Montana and Northeastern Oregon. Mining and trapping were the big draws in the early days. 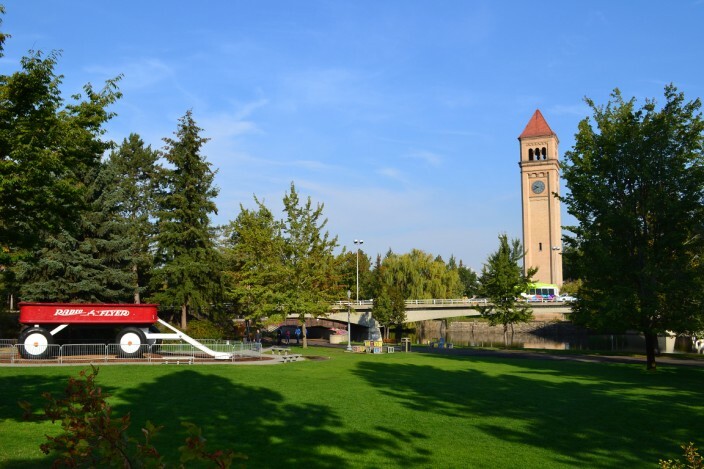 In the first half of the twentieth century the lumber trade and agriculture dominated along with manufacturing, while today Spokane is making a push towards the high-tech and service industries, with mixed results. We got into town about sunset, found a nice Mexican restaurant for dinner and called it a night. Next morning we spent a couple of hours poking around Riverfront Park and then hit the road again, heading east on Highway 2. 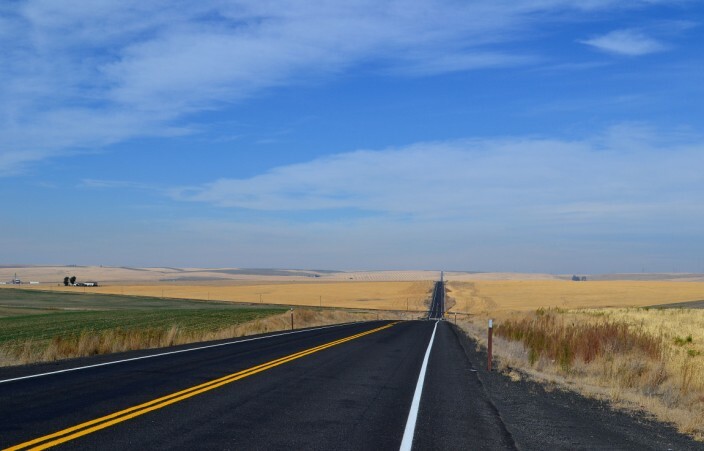 Surprisingly to me, as I’d never driven this particular stretch of road, it almost resembled the Palouse country around Pullman, with still more wheat fields rolling on for mile after mile. Is that Rod Serling popping up in the back seat again? Small towns dotted the landscape and made me remember what a different experience it is to drive a two-lane state highway as opposed to the interstate. Sure, it can seem like a hassle to drop your speed to 35, or even 25 mph and dawdle through one podunk town after another, and it takes a while to break out of that how-many-miles-am-I-covering-per-hour mentality. It brought to mind one of my favorite travel quotes, by Louis L’amour: “Too often I would hear men boast of the miles traveled that day, but rarely of what they had seen.” Slowly I recalibrated the brain and remembered I’m not on anyone’s schedule out here but my own, that time isn’t money and there are no deadlines to keep, fell into the rhythm of the road and it became fun to really see the places we were driving through instead of having them all pass by in a nondescript blur. After an hour or so, the topography began to change, the wheat fields once again disappeared and the sagebrush and rocks returned. We were heading into Grand Coulee territory of the Columbia River basin, and ultimately for the Grand Coulee Dam itself. 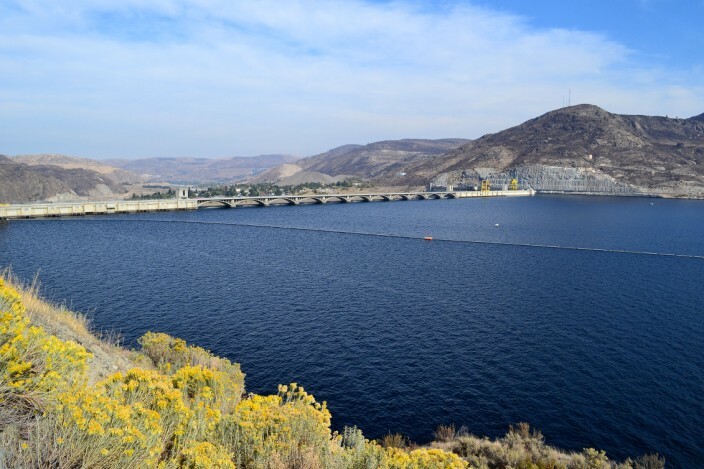 Grand Coulee Dam is one of the engineering marvels of the twentieth century. When you first lay eyes on this concrete giant sprawling across the Columbia River, your eyes and your brain almost can’t process just how huge this structure is until you read some of the facts. It’s more than a mile across, but standing there on the eastern bank of the river it doesn’t actually look that size. Preliminary excavation for building the dam began in 1933, with the first concrete pour occuring in 1935. But it wasn’t until June 1, 1942 that the first water washed over the spillway and the power plant became operational. At its peak, the massive project employed 8,000 people, a true boon for depression-era workers, but at the cost of 77 lives lost during construction. 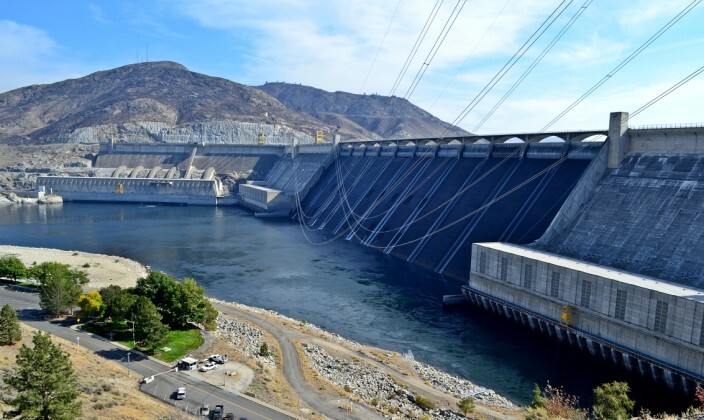 Grand Coulee dam is today the largest electric power-producing facility in the United States, and one of the largest concrete structures in the world. 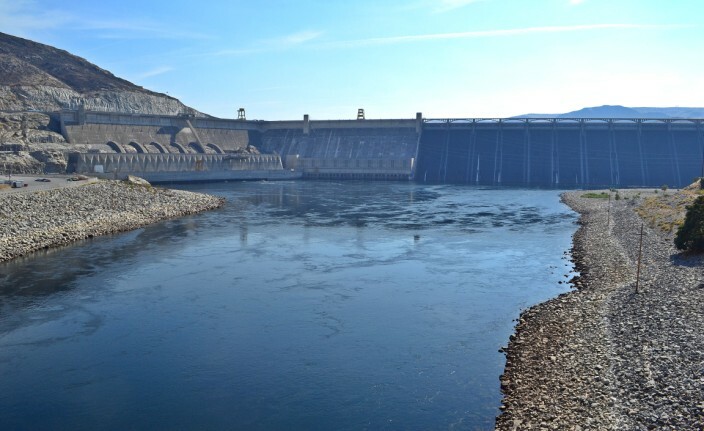 You can stop off at the Grand Coulee Dam visitors center and take a free tour of the third powerplant – well, usually you can, unless you show up on the day that a major overhaul and renovation project of the visitors facilities begins and everything is closed down. Yep, that’s exactly what happened to us. Rotten luck. So we drove around and took some photos, then walked across the bridge downstream of the dam and read the story of its construction from the photo placards laid out in succession as you cross the bridge on foot. It was a decent do-it-yourself substitute, but certainly not as good as going inside the facility itself. 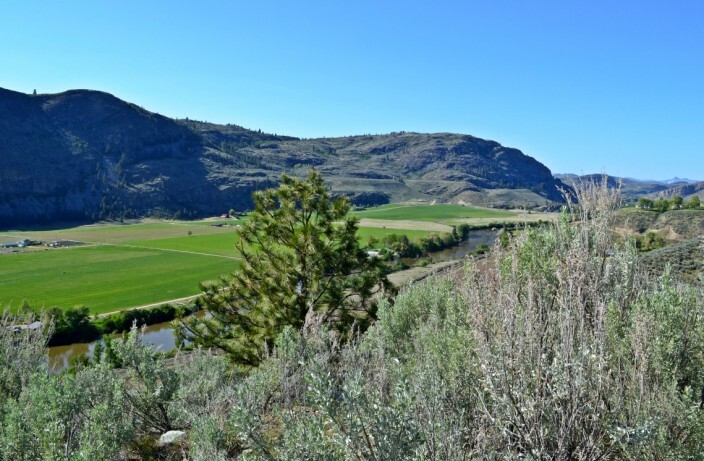 Moving on from the Grand Coulee area, we thought about heading west toward Okanogan country and the town of Omak, a quiet rural corner of north-central Washington that I’ve spent lots of time in as I have relatives in that area. But time constraints ruled that out along with one other mitigating factor: forest fires. 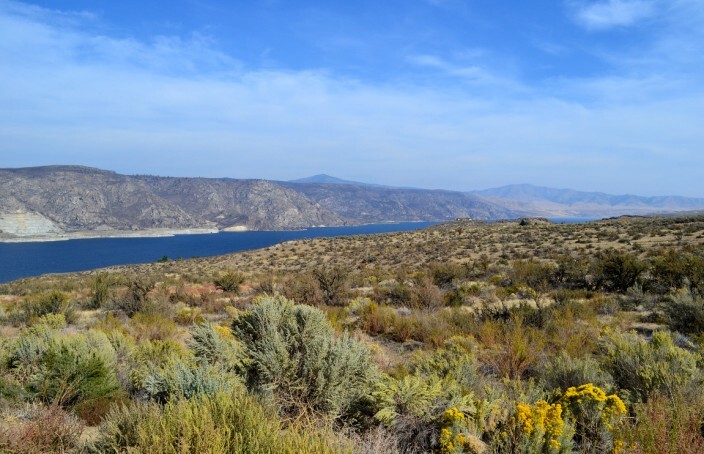 The summer of 2012 was one of the worst wildfire seasons in recent times in eastern Washington and there was a particularly long-lasting and widespread fire in the Wenatchee region which had spread heavy smoke over much of the area. So we headed south instead and were glad we did, as even in this direction away from the heaviest concentration of fires and attendant smoke, there was a thick, clinging brown haze over everything. You could smell it and you could see it and it made me feel sorry for the folks who had to live and breathe in it. This brown, hazy blanket of smoke dogged us for the next couple of hours and marred what otherwise would have been a fine, sunny day as we drove along Highways 17 and 28 past the Steamboat Rock area, Soap Lake, Ephrata and the Dry Falls. 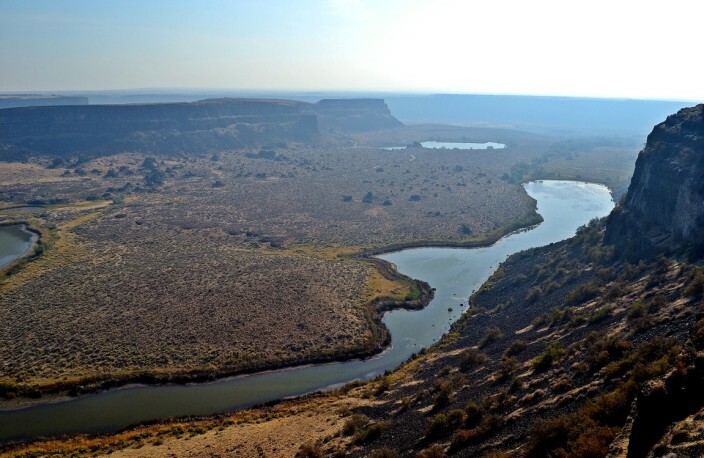 We pulled over for a closer look at Dry Falls, a spectacular geological anomaly which at one time in the prehistoric past was thought to have been the worlds greatest waterfall when this entire region, now an arid semi-desert, was part of an inland sea. 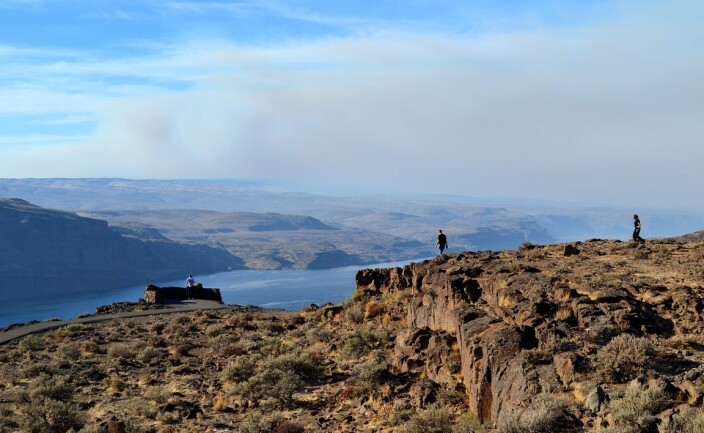 We hit I-90 and pointed our noses west, pulling off at the Vantage overlook of the Columbia River. We’ve stopped there many times before, but it’s such a tremendously scenic spot it lures us off the freeway every trip and never gets tiresome. At this point we’d left the worst of the wildfire smoke behind, but even from the Vantage lookout you could see it hanging like a wall to the north. We sped away from Vantage, homeward bound once more. That’s one of my favorite things about traveling. No matter how great the trip, nothing makes you appreciate home like returning after a few days, or weeks, or months, away. Thanks for the comment Indian Visa, if you ever follow up on that wish to visit drop me a line and I’d be happy to point you in the right direction! That is just stunning! I’ve always wanted to visit Washington. 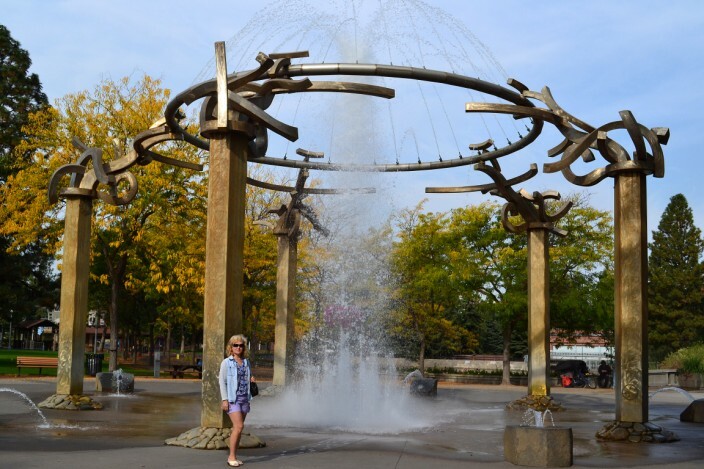 Love the Spokane Falls and river. Thanks for reading, Becky. 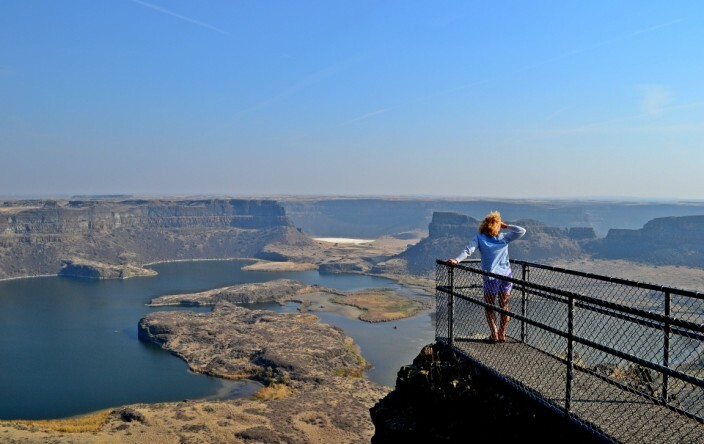 I’m going to have to go back to Dry Falls some time when the air is clear and not full of forest fire smoke! Thanks for the comment, Leigh. 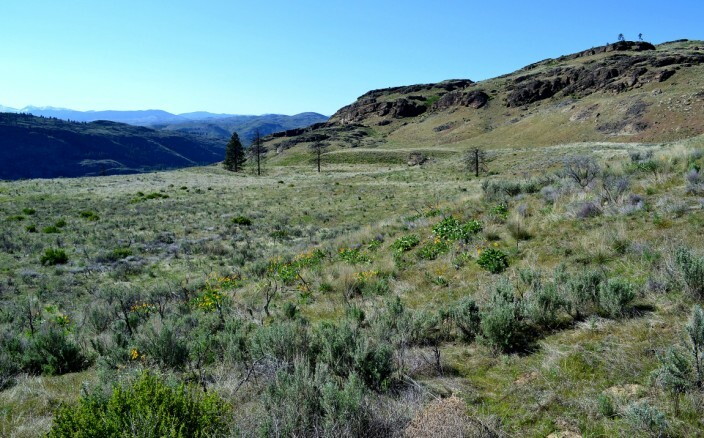 Yes, the backroads of Wash. state are a fantastic area to explore – and you’re never far from either a trail to hike or a winery to visit! I’ve driven across Washington state on the interstate though I was always in a rush. The backroads definitely deserve time for further exploration. The Columbia River area of course looks beautiful and I’d love to hike nearby and then sample wines at some of the wineries.